ALLETE Clean Energy has acquired six wind farms in Iowa, Minnesota, Oregon and Pennsylvania since 2011, In addition, ALLETE Clean Energy is developing the 106-megawatt Glen Ullin Energy Center wind farm in North Dakota and the 80-megawatt South Peak wind farm in Montana to sell power to utility customers under long-term power sale agreements. Both projects are expected to be completed in 2019. ALLETE Clean Energy also developed a 48-megawatt expansion of the Thunder Spirit wind farm in North Dakota that was sold to Montana-Dakota Utilities upon completion in October 2018. 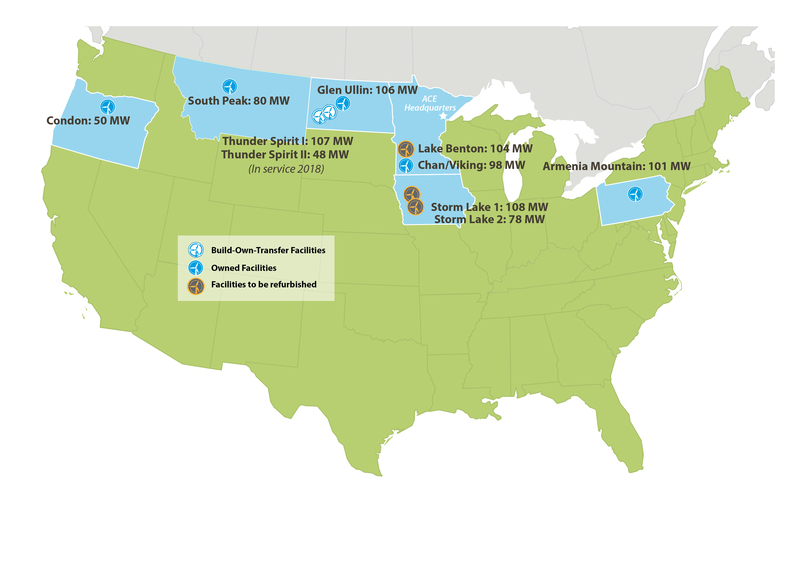 Montana-Dakota Utilities purchased the 107.5-megawatt first phase of Thunder Spirit in 2015. Much of this latest round of wind energy development was supported by ALLETE Clean Energy’s $135 million investment in wind turbines that qualify for Federal Renewable Energy Production Tax Credits. The investment allows ALLETE Clean Energy to aggressively pursue its three-pronged growth strategy that includes building and operating new wind farms based on long-term power purchase agreements, building wind farms for other companies for a development fee or a sale price, and refurbishing its existing wind farms while extending power sales agreements. 98-megawatt Chanarambie-Viking wind farm in southwest Minnesota. 104-megawatt Lake Benton wind farm, about 20 miles from the Chanarambie-Viking facility in southwest Minnesota. 101-megawatt Armenia Mountain wind farm in north-central Pennsylvania. 108-megawatt Storm Lake 1 and 78-megawatt Storm Lake 2 wind farms in Storm Lake, Iowa. 50-megawatt wind farm in Condon, Ore.
ALLETE Clean Energy is in the middle of an $80 million initiative to refurbish 385 wind turbines at the Lake Benton and Storm Lake I and II wind facilities through 2020. The project will improve turbine performance and reliability, generate federal production tax credits at each site and support the renewal of power sale agreements at the Storm Lake sites.